After two losses this weekend, Cal places fourth in the Pac-12 Power Rankings. It’s hard to imagine a more perfect start to the 2011 season than what the Bruins have orchestrated. Two weeks after dismantling rival USC on its home court, then-No. 7 UCLA played host to No. 1 Cal and No. 2 Stanford and dispatched both squads, jumping up to grab the No. 2 ranking in the nation. Now, the biggest obstacle facing the Bruins will be avoiding complacency, as the squad will have to wait until Oct. 15 to face another ranked opponent. UCLA stunned the Trojans in their conference opener to the tune of a 3-0 sweep. Since then, USC has done exactly the same to every team it has faced. Fresh off the crushing defeat, the Trojans stormed Seattle and obliterated a tough Huskies’ squad that was ranked fourth in the nation at the time. After an expected win over Washington State, coach Mike Haley’s club toppled the two best teams in the country — then-No. 1 Cal and then-No. 2 Stanford — in straight sets. Suddenly no one remembers that a lowly Central Florida team swept the Trojans in the preseason. And with good reason — they’re hotter than ever. Despite being a perennial powerhouse, No. 3 Washington still has yet to prove itself in 2011. The Huskies have only played three ranked teams. 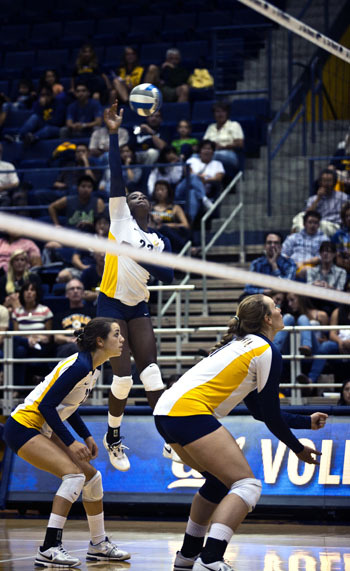 They defeated Long Beach State in the preseason, which was ranked No. 22 at the time of their late August meeting. Their conference matches against top-25 opponents resulted in a 3-0 drubbing by USC followed by a 3-0 drubbing of UCLA. The squad is leading the Pac-12 in both hitting percentage (.303) and opponent hitting percentage (.115), but it remains to be seen how these numbers will hold up against tougher teams. More clarity should surface this weekend as the Huskies play host to No. 15 Oregon. Perhaps one off-night is excusable for the top-ranked team in the country. Two in row calls the team’s potency into question. The Bears looked like they were sleep-walking for most of their two weekend matches against USC and UCLA, letting balls drop, missing serves and failing to adjust to defensive schemes. Perhaps more importantly, Cal lacked a sense of urgency. As a result, coach Rich Feller’s squad slips from first to fifth in the conference standings. Stanford lost contests against the Southern California powers this weekend as well, which seems to diminish the value of the Bears’ win over the Cardinal earlier in the season. Granted, the Los Angeles trip is notoriously the most difficult for the two Bay Area squads. The Bears will need to decisively right the ship this weekend to remain in contention for a conference crown. The No. 6 Cardinal are currently dealing with the Dr. Jekyll and Mr. Hyde syndrome. There have been times this season when Stanford has looked like a legitimate national title contender, including wins over No. 9 Penn State and No. 13 Florida, and even a valiant five set loss to now-No. 2 UCLA. However, there have also been times when the Cardinal have looked rather average, illustrated by ugly losses against Cal and USC. Until the team finds its identity, it’s going to find itself stuck in the middle of a very crowded conference. Technically, the Ducks are atop the Pac-12 standings with a perfect conference record. However, they were dubbed the 15th-best team in the country, and five Pac-12 teams are ahead of Oregon in the coaches’ poll. The discrepancy in standings and rankings stems from the fact that the Ducks have yet to play a formidable conference foe. Playing the likes of the two Arizona schools, Colorado and Utah, Oregon has only dropped one set. It’s hard to take the squad seriously, even though it posted a 3-1 win over defending national champs Penn State in the preseason. If Oregon can steal a win in Seattle this weekend, the squad will become more legitimate and its stock should soar. The Beavers currently boast a relatively impressive record, but lack any big wins to defend themselves as a team that belongs in the top half of the Pac-12. Early season losses to South Dakota and Gonzaga don’t exactly inspire confidence in this squad, either. A tough road trip this weekend to face the Washington schools should balance out Oregon State’s conference record. No real surprises here. The Wildcats have beaten teams they should’ve beaten (Washington State and Oregon State) and lost to teams that are clearly superior (Oregon and Washington). Arizona’s nonconference slate was fairly weak, except for a tilt against Hawaii, which the Wildcats dropped in three sets. Still, they garnered 17 votes in the national coaches’ poll, but are on the outside looking in. A win or even a tightly contested match this weekend against Cal or Stanford could propel Arizona into the rankings. The Cougars picked up a nice five-set win over Arizona State in Tempe, but have yet to win a set against another Pac-12 school. That the team ranks last in the conference in kills hasn’t helped remedy that problem. The Sun Devils don’t have a conference win yet this season, but at least they’ve come close. They dropped their Pac-12 opener against Oregon State in five sets, falling in extra points. Nearly the same thing happened in ASU’s conference home opener against Washington State, with the Sun Devils dropping in five frames. They also took a set against then-No. 18 Oregon, which is mildly impressive for a team of that caliber. Something will eventually go ASU’s way — likely in three weeks when it faces the conference’s two newcomers, Utah and Colorado. If not for Colorado, the Utes would certainly be last on this list. Since sweeping its new conference “rival” in the Buffaloes on Sept. 13, Utah has lost 12 consecutive sets. That trend will likely continue this weekend, as the Utes play host to UCLA and USC. The Buffaloes have not won a single set, let alone a match, since joining the Pac-12. They came close to stealing a frame from Cal when they ventured into Haas Pavilion a week and a half ago, but the Bears won it in extra points. In Colorado’s last match, the team barely got to double digits in sets two and three against a mediocre Oregon State team. It’s hard to imagine the Buffaloes finishing anywhere but last.